DOWNLOAD "CMBP - mount and connect" as pdf document. CMB's may be mounted either by mechanical clamping or gluing. CMB's are not machined on top and bottom surfaces and as such may have small variations in the surface. For this reason a mechanical clamping should be done with moderate force, approximately 5 times the specified blocking force. If mounted with glue it should be emphasized that the gluing contact surface is restricted to cover only the inactive part of the bender and as such not reduce the stroke of the bender. Epoxy glues are well suited for gluing piezoceramics and several alternatives exists. Please contact us if you need support on selection of appropriate glue for your application. In this mode the bending can be controlled both upwards and downwards. Apply +100V to the red wire, -100V to the black wire and a voltage Vo to the blue wire such as –100Vin<100V. 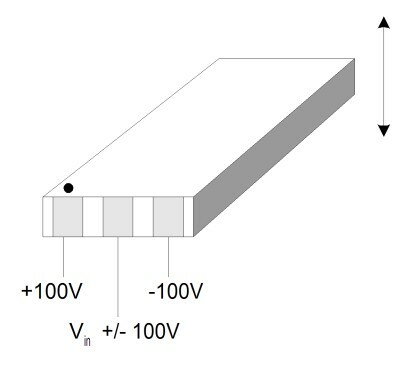 If 0in<100V, the plate will bend down with the black spot facing up. If –100Vin<0, the plate will bend up with the black spot facing up. In this mode the bending can be controlled for one side only, i.e. bending up with the black spot facing up. Apply 0V to the black and blue wire, and up to 200V to the red wire. This application note is intended to provide brief information and support on double-clamp mounting of benders. CMBP's may be clamped in both ends (double clamp mounting) either by mechanical clamping or gluing. CMBP in the double-clamp configuration will generate four times the blocking force and one-fourth the deflection obtained in a simple cantilever configuration. 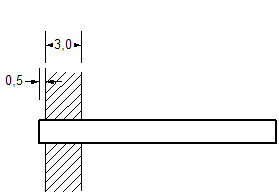 A mechanical clamping should be done with moderate force (approximately 5 times the specified blocking force) and with a clamping length as reduced as possible (approximately 1mm). Mounting of CMB's. Examples of mechanical clamping. Dimensions in mm. Double-clamp mounting can be done by using adhesives like epoxies. Epoxy glues are well suited for gluing piezoceramics and several alternatives exist. Soft epoxies are preferable, as mounting of plate benders at its extremity needs some flexibility at the contact line. Mounting of CMB's. Examples of gluing. Dimensions in mm. 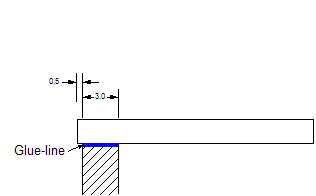 To avoid significant loss of performances, the mounting of the bender should minimize the surface in contact between the component and the clamping device.